Facebook trading opened with it’s IPO and closed at $105 billion market capitalization. I wondered how my model tracked reality over the last six months. Facebook stats put users at 901 million at the end of March. My maximum likelihood run was rather lower than that – it corresponds with the K950 run in my last post (saturation users of 950 million), and predicted 840M users for end of Q1 2012. The latest data point corresponds with my K1250 run. 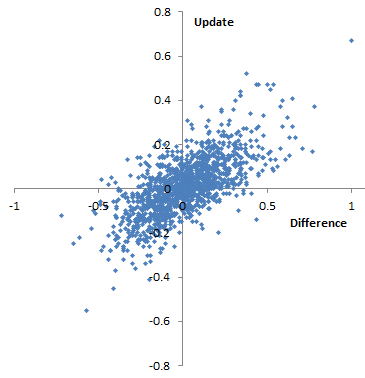 I’m not sure if it’s interesting or not, but the new data point is a bit of an outlier. For one thing, it’s reported to the nearest million at a precise time, not with aggressive rounding as in earlier numbers I’d found. Re-estimating the model with the new, precise data point, it’s necessary to pass on the high size over most of the data from 2008-2011. That seems a bit fishy – perhaps a change in reporting methods has occurred. In any case, it hardly matters whether the user carrying capacity is a bit over or under a billion. Either way, the valuation with current revenue per user is on the order of $20 billion. I had picked $5/user/year based on past performance, which turned out to be very close to the 2011 actuals. It would take a 10-year ramp to 7x current revenue/user to justify current pricing, or very low interest rates and risk premiums. So the real question is, can Facebook increase its revenue per user dramatically? “I have no interest in shorting a cultural phenomenon,” hedge fund manager Jeffrey Matthews of Ram Partners in Greenwich, Connecticut, told Reuters in an email interview. Steve Strogatz’ popular book Sync is a nice, accessible treatment of this kind of phenomenon. Sit down and shut up while I tell you. More interesting, though, is that practically everything is weak, except the educational level of society – a big positive feedback. 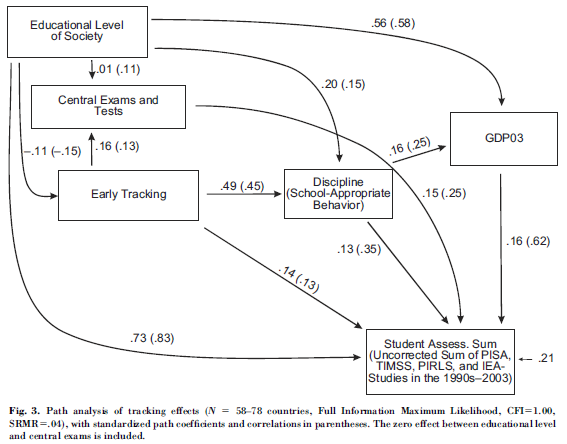 Author TomPosted on May 15, 2012 Categories EducationLeave a comment on What drives learning? We already have to fly in planes designed by lawyers (metaphorically speaking). Now House Republicans want to remove the windows and instruments from the cockpit. This is stupid. Really stupid. I’ve used ACS data on numerous public and private sector consulting engagements. I’m perfectly willing to pay for the data, but I seriously doubt that the private sector will supply a substitute. Anyway, some basic free data is needed so that all citizens can participate intelligently in democracy. Lacking that, we’ll have to fly blind. Say, what’s a mountain goat doing up here in a cloud bank? 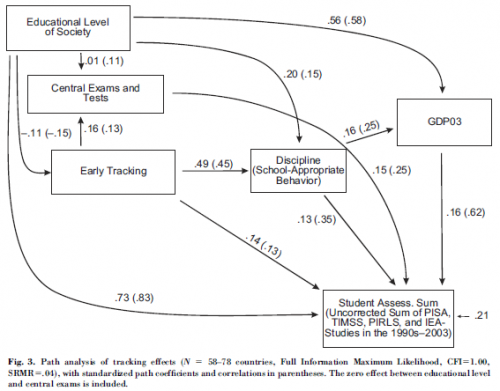 I’m still attracted to the idea of objective measurements of teaching performance. * But I’m wary of what appear to be some pretty big limitations in current implementations. Within reason, high measurement error by itself is not an obstacle to getting some performance benefit from value added rankings. High measurement error is rough on individual teachers. This makes current use of VAM for tenure decisions suspect. It makes it hard for teachers to learn from their better-performing peers, because identification of high performers becomes somewhat random. Feedback effects severely limit the potential for widespread use of VAM to improve education performance across the board. I think the bigger issues have more to do with the content of the value added measurements rather than their precision. There’s nothing mysterious about what teacher value added measures. It’s very explicitly the teacher-level contribution to year-on-year improvement in student standardized test scores. Any particular measurement might contain noise and bias, but if you could get rid of those, there are still some drawbacks to the metric. Testing typically emphasizes only math and English, maybe science, and not art, music, and a long list of other things. This is broadly counterproductive for life, but also even narrowly for learning math and English, because you need some real-world subject matter in order to have interesting problems to solve and things to write about. Life is a team sport. Teaching is, or should be, too. (If you doubt this, watch a few episodes of a reality show like American Chopper and ponder whether performance would be more enhanced by better algebra skills, or better cooperation, communication and project management skills. Then ponder whether building choppers is much different from larger enterprises, like the Chunnel.) We should be thinking about performance accordingly. A focus at the student and teacher level ignores the fact that school system-level dynamics are most likely the biggest opportunity for improvement. Putting teachers in a measurement-obsessed command-and-control environment is surely not the best way to attract high-quality teachers. It’s hard to see how putting every student through the same material at the same pace can be optimal. It doesn’t make sense to put too much weight on standardized test scores, when the intersection between those and more general thinking/living skills is not well understood. If no teachers are ever let go for poor performance, that probably signals a problem. In fact, it’s likely a bigger problem if teacher performance measurement (generally, not just VAM) is noisy, because bad teachers can get tenure by luck. 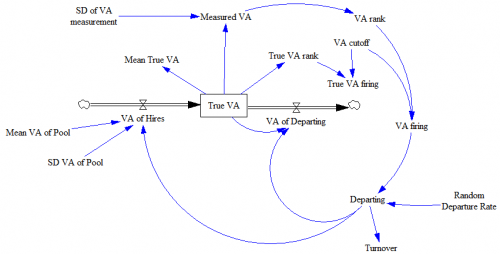 If VAM helps with the winnowing process, that might be a useful function. But it seems to me that the power of value added modeling is being wasted by this musical chairs*** mentality. The real challenge in teaching is not to decrease the stock of bad teachers. It’s to increase the stock of good ones, by attracting new ones, retaining the ones we have, and helping all of them learn to improve. Of course, that might require something more scarce than seats in musical chairs – money. * A friend and school board member in semi-rural California was an unexpected fan of No Child Left Behind testing requirements, because objective measurements were the only thing that finally forced her district to admit that, well, they kind of sucked. ** A friend’s son, a math teacher, proposed to take a few days out of the normal curriculum to wrap up some loose ends from prior years. He thought this would help students to cement the understanding of foundational topics that they’d imperfectly mastered. Management answered categorically that there could be no departures from the current year material, needed to cover standardized test requirements. He defied them and did it, but only because he knew that it would take the district a year to fire him, and he was quitting anyway. *** Musical chairs has to be one of the worst games you could possibly teach to children. We played it fairly regularly in elementary school. In my last post, I showed that culling low-performance teachers can work surprisingly well, even in the presence of noise that’s as large as the signal. Fired teachers don’t just disappear into a cloud; they go back into the teacher labor pool. This means that, as use of VA evaluation increases, the mean quality of the labor pool goes down, making it harder to replace teachers with new and better ones. This is unambiguously a negative (balancing) feedback loop. The quality of the labor pool could go up through a similar culling process, but it’s not clear that teacher training institutions can deliver 50% more or better candidates, or that teachers rejected for low value added in one district will leave the pool altogether. Increased use of VA changes the voluntary departure rate of teachers from the district, with different effects on good and bad teachers. Increased use of VA changes the ease of hiring good teachers. 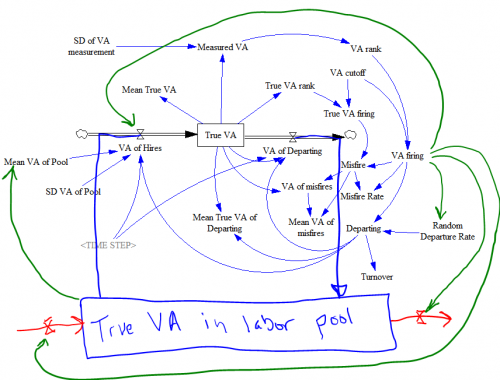 Increased use of VA attracts more/better teachers to the labor pool, and reduces attrition from the labor pool. On balance, I’d guess that these are currently inhibiting performance. Value added measurement is widely perceived as noisy and arbitrary, and biased toward standardized learning goals that aren’t all that valuable or fun to teach to. 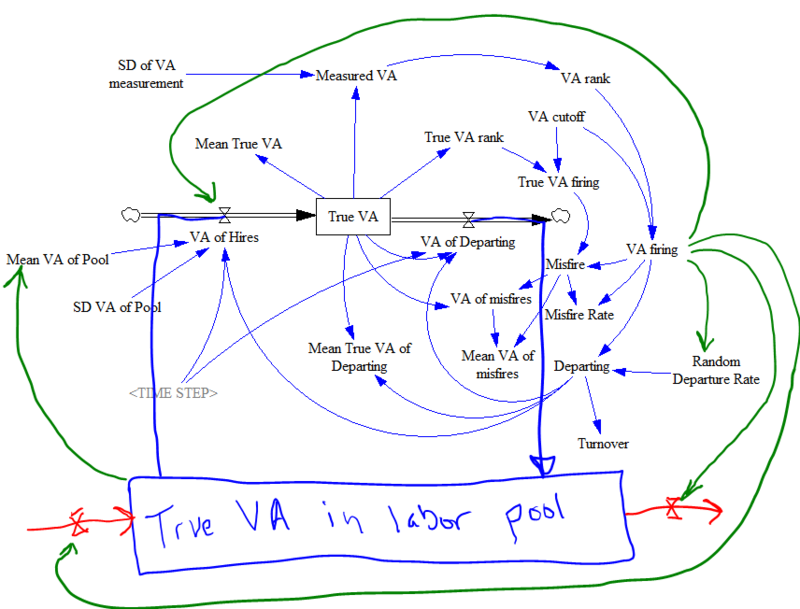 Increasing the rate of departure requires a corresponding increase in the hiring rate, but this is not free, and there’s no guarantee that the labor pool supports it. There are some additional limiting loops implicit in Out with the bad, in with the good. 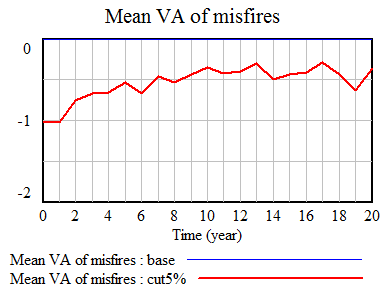 Together, I think these effects most likely limit the potential for Value Added hiring/firing decisions to improve performance rather severely, especially given the current resistance to and possible problems with the measurements. Suppose for the sake of argument that (a) maximizing standardized test scores is what we want teachers to do and (b) Value Added Modeling (VAM) does in fact measure teacher contributions to scores, perhaps with jaw-dropping noise, but at least no systematic bias. Jaw-dropping noise isn’t as bad as it sounds. Other evaluation methods, like principal evaluations, aren’t necessarily less random, and if anything are more subject to various unknown biases. (Of course, one of those biases might be a desirable preference for learning not captured by standardized tests, but I won’t go there.) Also, other parts of society, like startup businesses, are subjected to jaw-dropping noise via markets, yet the economy still functions. Further, imagine that we run a district with 1000 teachers, 10% of whom quit in a given year. We can fire teachers at will on the basis of low value added scores. We might not literally fire them; we might just deny them promotions or other benefits, thus encouraging them to leave. We replace teachers by hiring, and get performance given by a standard normal distribution (i.e. performance is an abstract index, ~ N(0,1)). 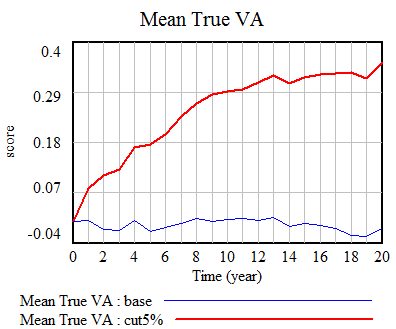 We measure performance each year, with measurement error that’s as large as the variance in performance (i.e., measured VA = true VA + N(0,1)). Structure of the system described. Note that this is essentially a discrete event simulation. Rather than a stock of teachers, we have an array of 1000 teacher positions, with each teacher represented by a performance score (“True VA”). With such high noise, does VAM still work? The short answer is yes, if you don’t mind the side effects, and live in an open system. If teachers depart at random, average performance across the district will be distributed N(0,.03); the large population of teachers smooths the noise inherited from the hiring process. Suppose, on top of that, that we begin to cull the bottom-scoring 5% of teachers each year. 5% doesn’t sound like a lot, but it probably is. For example, you’d have to hold a tenure review (or whatever) every 4 years and cut one in 5 teachers. Natural turnover probably isn’t really as high as 10%, but even so, this policy would imply a 50% increase in hiring to replace the greater outflow. Then suppose we can increase the accuracy of measurement from N(0,1) to N(0,0.5). 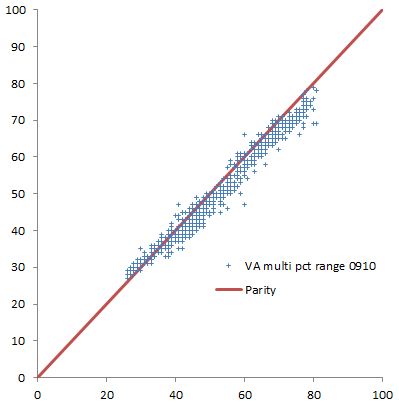 In our scenario (red), the true VA of teachers in the district goes up by about .35 standard deviations eventually. Note the eventually: quality is a stock, and it takes time to fill it up to a new equilibrium level. Initially, it’s easy to improve performance, because there’s low-hanging fruit – the bottom 5% of teachers is solidly poor in performance. But as performance improves, there are fewer poor performers, and it’s tougher to replace them with better new hires. Extreme noise defeats the selection process, because firing becomes essentially random. There’s no expectation that a randomly-fired teacher can be replaced with a better randomly-hired teacher. Next post: why all of this this is limited by feedback. I can’t resist a dataset. 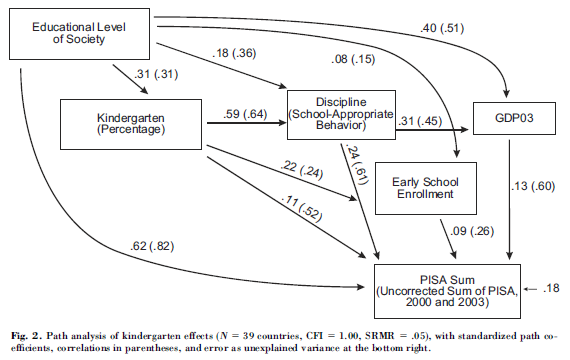 So, now that I have the NYC teacher value added modeling results, I have to keep picking at it. 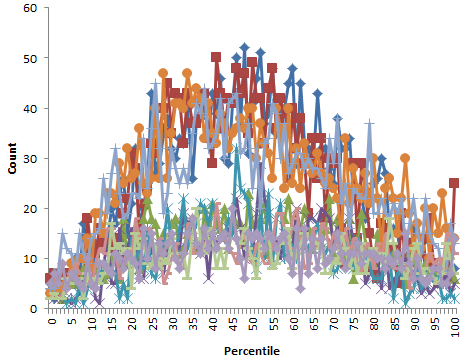 Nonuniform distribution of percentile ranks for 2007-2008 school year, for 10 subject-grade combinations. That leaves only two data points: 2008-2009 and 2009-2010. That’s not much to go on for assessing the reliability of teacher ratings, for which you’d like to have lots of repeated observations of the same teachers. Actually, in a sense there are a bit more than two points, because the data includes a multi-year rating, that includes information from intervals prior to the 2008-2009 school year for some teachers. 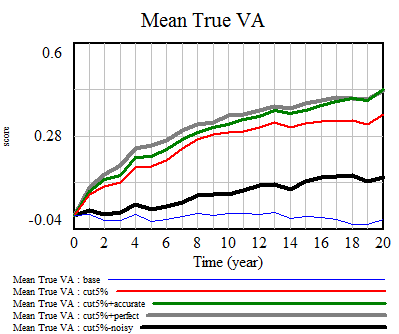 So, you’d expect that the multi-year score would behave like a SMOOTH, with the estimated value adjusted incrementally toward each new single-year value observed, and the confidence bounds narrowing with sqrt(n) as observations accumulate. You’d also expect that individual years would have similar contributions to the multi-year score, except to the extent that they differ in number of data points (students & classes) and data quality, which is probably not changing much. Difference of 09-10 score from 08-09 multi-year score vs. update to multi-year score from 08-09 to 09-10. I’d expect this to be roughly diagonal, and not too noisy. 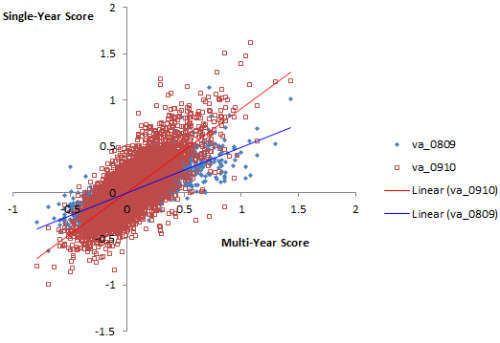 However, it appears that there are a significant number of teachers for whom the multi-year score goes down, despite the fact that their annual 09-10 score exceeds their prior 08-09 multi-year score (and vice versa). This also occurs in percentiles. This is 4th grade English, but other subject-grade combinations appear similar. 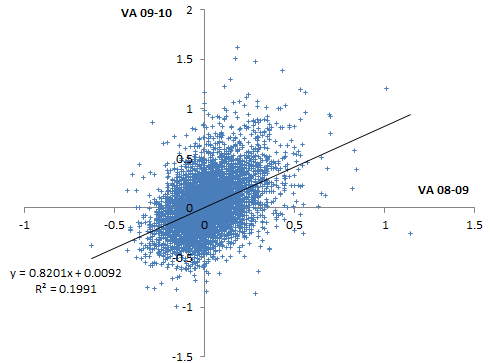 Plotting single-year scores for 08-09 and 09-10 against the 09-10 multi-year score, it appears that the multi-year score is much better correlated with 09-10, which would seem to indicate that 09-10 has greater leverage on the outcome. Again, his is 4th grade English, but generalizes. 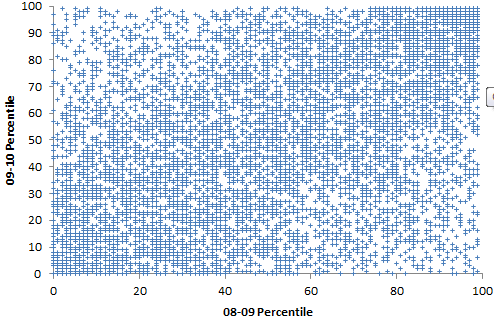 Percentile range (confidence bounds) for multi-year rank in 08-09 vs. 09-10 school year, for teachers in the 40th-59th percentile in 08-09. Ranges mostly shrink, but not by much. I hesitate to read too much into this, because it’s possible that (a) the FOI datasheets are flawed, (b) I’m misinterpreting the data, which is rather sketchily documented, or (c) in haste, I’ve just made a total hash of this analysis. But if none of those things are true, then it would seem that the properties of this measurement system are not very desirable. 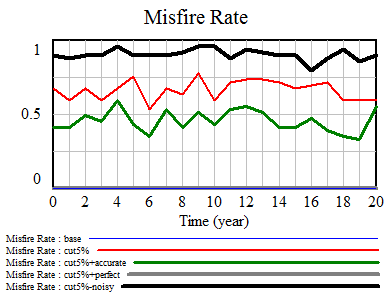 It’s just very weird for a teacher’s multi-year score to go up when his single-year score goes down; a possible explanation could be numerical instability of the measurement process. It’s also strange for confidence bounds to widen, or narrow hardly at all, in spite of a large injection of data; that suggests that there’s very little incremental information in each school year. Perhaps one could construct some argument about non-normality of the data that would explain things, but that might violate the assumptions of the estimates. Or, perhaps it’s some artifact of the way scores are normalized. 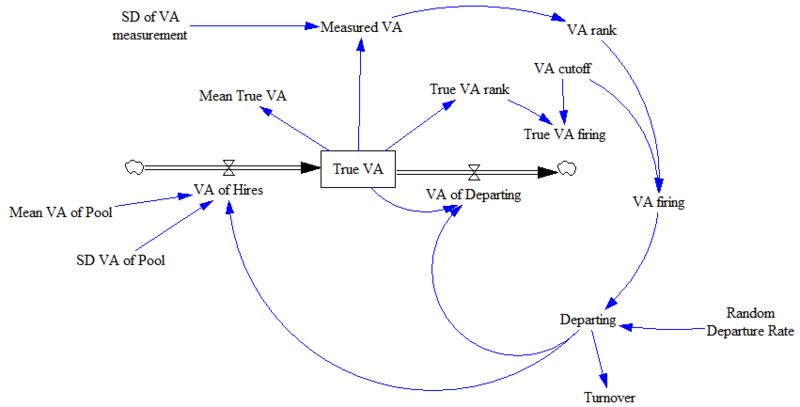 Even if this is a true and proper behavior of the estimate, it gives the measurement system a face validity problem. For the sake of NYC teachers, I hope that it’s (c). In Western cultures, the future lies ahead; the past is behind us. These notions are embedded in both gestures and spoken metaphors (looking forward to next year or back over the past year). A forward hand motion typically accompanies talk of the future; references to the past often bring a wave over the shoulder. It is hard for most Westerners to conceive of other ways of conceptualizing time. But in 2006, Rafael Núñez, a cognitive scientist at the University of California, San Diego, reported that for the Aymara, an ethnic group of about 2 million people living in the Andean highlands, in both spoken and gestural terms, the future is unseen and conceived as being behind the speaker; the past, since it has been witnessed, is in front. They point behind themselves when discussing the future. And when talking about the past, Aymara gesture farther in front of them the more distant the event …. I like the Aymara approach, with the future unseen behind the speaker. I bet there aren’t any Aymara economic models assuming perfect foresight as a model of behavior.